When I moved to Centre County, Pennsylvania in August, I certainly never thought I would be bracing for one of the most legendary storms the east coast has ever seen. Granted, I hate storms. Regular, old thunderstorms can still send me running for my Daddy’s arms! The host family I am living with took any and all precautions. We stocked water and food, filled the bathtubs with water, had the wood-burning stove on for heat, and said our prayers. Sure enough, the wind hit. I am used to windy west Texas days, but it is different when you are in the woods and hear the creaking, cracking and snapping of every branch. The rain came next, pounding the windows. The lights in the house flickered. My “little sisters” (ages 6 and 4) wide-eyed and desperate looked to me for affirmation. “It’s going to be fine girls…” when inside I was incredibly uneasy. It is amazing how brave you can be for little ones! Monday night, I crawled down to the basement with the girls while the parents stayed upstairs with the baby. The girls started out on the ground in Cinderella and Tinkerbell sleeping bags… somehow we all ended up on my air mattress. For the record, sharing an air mattress with those two was far more dangerous than any hurricane! SMACK – foot in face. PUNCH – fist in gut. DROOL – way too close for comfort! Lying there with the girls fast asleep on either side of me, I began to pray - one of us wasn't sleeping! 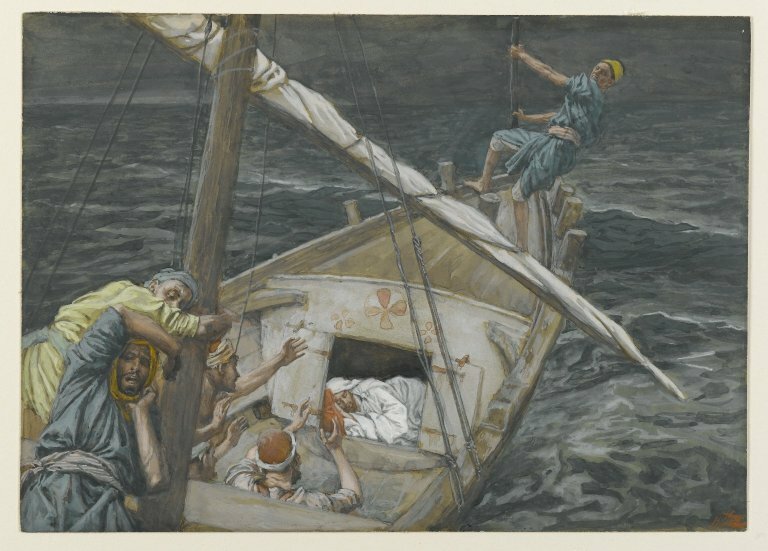 The Lord brought to mind the story in Mark 4 where Jesus and the disciples were out on a boat when a big storm blew up. They became fearful of the rain and waves that walloped the boat and angry that Jesus was somehow sleeping through it below deck. In the basement, we were “below deck.” No windows to see out of; the fan from the wood-burning stove blocking out all noise. I was only aware that there was a storm because I had observed it prior to going downstairs. Then the Spirit asked me a question (seems like the theme lately). What would have happened if the disciples came down and rested with Me instead of fighting the storm? The story in Mark 4:35-41 is considered a midrash of the story of Jonah; Midrash is a tool of interpretation which assumes that every word, letter, and every stroke of the pen in the Torah has meaning. Midrash Aggadah focuses on biblical narratives and can include any retellings, additions, or twists on Torah stories. The story of Jonah and the storm recorded in Mark 4 are designed to parallel one another – with just a few differences. 1. Jesus was the one who suggested they pile in the boat and cross over to the other side - the Decapolis. The Decapolis was a grouping of ten cities on the eastern frontier of the Roman Empire. Each city had a certain degree of autonomy and self-rule; complete with idol worship, paganism, sexual immorality… Much like the city of Nineveh. 3. Jonah awoke and jumped overboard. 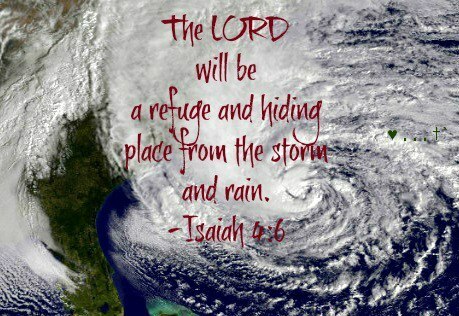 Jesus awoke and calmed the storm. In verse 41 of Mark 4, the disciples were terrified and asked each other, “Who is this? Even the wind and the waves obey him!” Because they knew the promise of the Psalms, they began to recognize that Jesus was more than just an influential Rabbi… He was exactly who the prophets and writers of Psalms wrote about. How would the story have ended if the disciples chose to rest with Jesus instead of battle their circumstances? Lying in the cold basement with the girls, I had much of the night to ponder the potential outcome (of Sandy and the question God asked me). While the Mark 4 Bible story has already been written, I can choose how I would like mine to end. Rather than being rebuked by my Savior because of my small faith, I would much rather take comfort in curling up next to my Jesus. I can’t think of any safer place to be. Then I looked at my precious sisters asleep on my shoulders… they were unaware of how dangerous the night was. They were not concerned with power outages or flooding. For all they knew, we were having a special campout downstairs on the airbed! Childlike faith is a beautiful thing… I want to lay down in the stern of the boat with Jesus. In the last eight months, I have faced the greatest storm of my life. I have been guilty of trying to steady the boat by myself. Think Deadliest Catch weather with fiery, little me attempting to do something about it... kind of pathetically humorous, huh? Jesus is the one who led me to this place. He is the one who is leading you across your ocean. You and I will have a much more enjoyable trip if we learn to lie down and rest rather than fearfully battle what we can not control. If you are taking a Jonah-style nap, I hope you wake up before you are thrown overboard to a whale... Those taking a Jesus-style nap, I thank you for your example of faith and peace in my life.